Counselors, educators and coaches who wish to provide job search and resume preparation services, can purchase training, client notebook, and audio CDs for their client or classroom sessions. From its practical daily client coaching, IDAK has developed a 10 week (and longer if needed) packaged service with the curriculum to give a client/student the tools needed to research their best Career Match options, narrow the best to one, develop an employer contact list in their city, prepare a resume, prepare for interviews, search for hidden jobs, best use websites, social media for networking, how to compete for advertised vacancies, and finally, receive and negotiate a job offer. Over twelve hours of CD audio instruction supplement the notebook materials. The audio CDs are professionally recorded and produced so that they are ready to be distributed to one’s clients or students.The audio instructors include seven professionals: a psychologist, head hunter, Human Resource Director, three IDAK counselors, and a moderator. 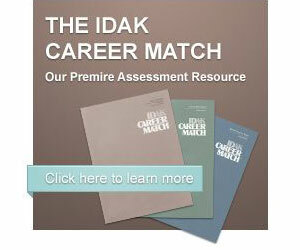 Training includes one complete notebook, CD album and two days of IDAK instruction. The training also includes a license agreement to purchase and use additional notebooks and CDs with clients or students.